In these newly-politicized times, we have been overwhelmed by a barrage of devastating attacks on societal norms, resulting in feelings of helplessness and doom. But we understand this as an opportunity to connect and to celebrate our fleeting notions of democracy. What better way than to spend possibly our last moments returning to more primal forms of solace: food and music? 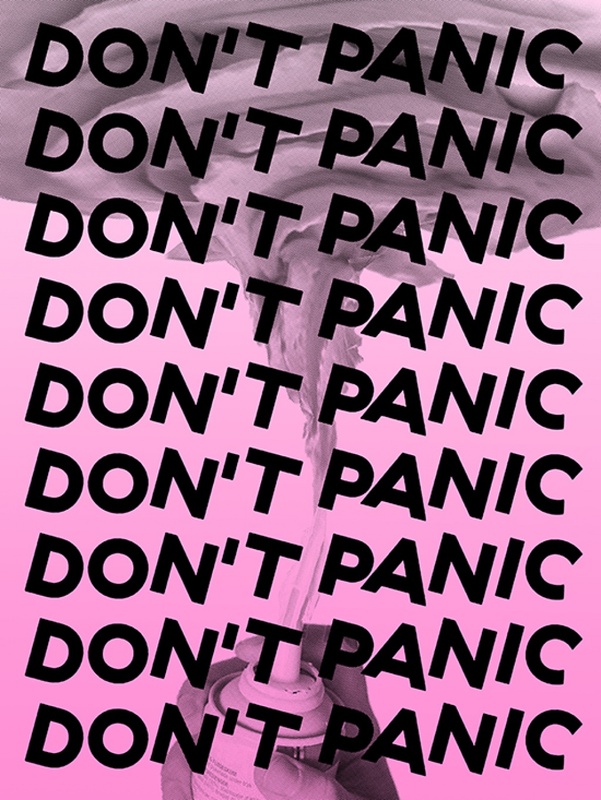 Don’t Panic exists somewhere among a dinner party, a formal gallery exhibition, and an end-times blowout, manifested in two parts: First is Diana Ho’s Live Vanitas, a work that serves as a living record of time through food. Second is Irwin Todd’s sculptural sound system, KALLAX, that will synthesize found audio throughout the evening. Live Vanitas is a living, participatory installation inspired by Dutch still life paintings of the 16th-17th centuries that served as reminders of mortality. In this work, food and beverages are laid out along a table for viewers to consume at will. Viewers are encouraged to leave out, throw out, or pile up the remnants of this process, as a camera documents throughout the evening. Clocks along the wall are the backdrop to this banquet, many with faces cloaked and distorted while still functioning, creating a composition of disquieting ticks without revealing its true time. Irwin Todd’s sound system draws on audio traditions he encountered while living in the UK that originated in Jamaica. The work is built from a discarded bookshelf – part speaker system and part library – playing a curated selection of audio, while displaying materials that express counter-hegemonic views and aspirations. Viewers are encouraged to interact with the piece, as well as make requests. Diana Ho is a Brooklyn-based painter and sculptor who often works with fiber, textile, and embroidery. Much of her work focuses on the transformation of everyday objects, exploring the mundane, yet deeply intimate relationship we have with our belongings. Diana received a BFA in illustration from the School of Visual Arts and has since worked with off-Broadway theatres, indie musicians, and world-renowned fine artists. Her latest venture is in the world of pop-up retail, with the formation of From Here to Sunday – a gift shop that collaborates with local artists and businesses to bring curated, small batch goods to the masses. As an ever-evolving small business that crops up in different contexts, she hopes FHTS will blur the line between fine art and retail, ultimately making the arts more accessible to everyone. Irwin Todd is a multi-disciplinary artist based in Brooklyn. His work integrates object, image, and sound with print to create minimal, yet layered work inspired by international design, DIY, and situationist aesthetics. Irwin holds an MFA from Ohio University and has exhibited work nationally and internationally, at various museums, galleries, and artist-run spaces.